CHRISTMAS MAY BE done and dusted, but that doesn’t mean we can’t think about where we’re getting our next decadent meal from. With that in mind, we asked a selection of top Irish chefs for their bucket list dining destinations around Ireland. From restaurants to hotels to pizzerias, their recommendations ought to provide ample inspiration for people looking for their next foodie fix. An Irish restaurant on my bucket list for 2019 is The Lady Helen Restaurant at Mount Juliet. I’ve been meaning to go for a while as I like the style of John Kelly’s food and he seems to be a chef who spends his time in his kitchen. Dave Fitzgibbon is chef and proprietor of St George’s Terrace Restaurant and Cookery School in Carrick-on-Shannon, Co Leitrim. There are so many on my bucket list! Liath (formerly known as Heron & Grey), Wild Honey Inn, Chestnut Restaurant – all doing very different and exciting food! But right now I would have to say I want to grab a few pals for a proper Sunday lunch. So The Tannery, 1826 Adare and Sage are ones to be ticked of the list first! Ali Honour is chef and proprietor of Ali’s Kitchen in Cork. One place my partner Elaine and I are very excited to visit for dinner is Aimsir Restaurant which is located in the Cliff at Lyons in Co Kildare and is opening in 2019. Rob Krawczyk is the chef and proprietor of Restaurant Chestnut in Ballydehob, Co Cork. Miyazaki has to be the best takeaway. At Bastion, we are all about ‘under-promise, over-deliver’ and Miyazaki has this in spades. The Greenhouse for me is the best food in the country. For me, it comes second only to a meal I had in Eleven Madison Park but that was my wedding dinner so I might be biased! We were in Kitchen Table and Restaurant Story in London recently and The Greenhouse still wins. He really is an amazing chef. For a casual night out there is Sage in Midleton or Juniors in Dublin. I used to work with Paul McNerney [of Juniors] about 14 years ago and whatever he touched turned to gold. He is probably the most natural cook I’ve worked with and makes it look effortless, too. For burgers Son of a Bun in Cork has it nailed. Look no further, you won’t find a better burger in Ireland. Helen Noonan is the owner of Bastion in Kinsale, Co. Cork. For me it would be a simple joint, Pi. The upswing of pizza quality in the last few years has been incredible and Pi is the kind of casual place that I love. 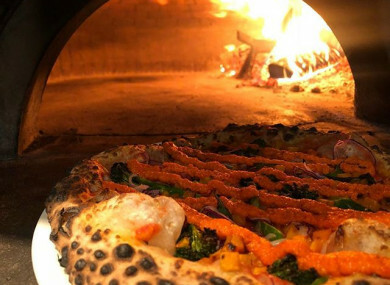 No corners are cut in the process and it’s fast food that delivers a smile when you bite that perfectly charred pizza. It’s always full of chefs when I go there. Honourable mention for Uno Mas, my go to spot for great wine and a feed. Gaz Smith is chef and owner of Michael’s in Mount Merrion, Dublin. #JobFairy Hi everyone, desperately need chefs. Come make these every day with real fire!!! Spread the word, giz a shout! Email “14 of the most incredible bucket-list dinners around Ireland, according to top chefs”. Feedback on “14 of the most incredible bucket-list dinners around Ireland, according to top chefs”.